When watching a Hindi movie, I often consider whether someone who has never seen a Bollywood movie before would enjoy it. To someone who likes romances, I’d recommend Love Aaj Kal; for a fan of family-friendly sports movies, I’d suggest Chak De India. But I think Aakrosh might have the widest appeal to American filmgoers (adults only, as there is some graphic violence). Aakrosh‘s biggest selling point is its construction. It’s a well-paced thriller in which the lead characters — who truly grow over the course of the film — are placed in a difficult situation that becomes terrifying as the story progresses. The familiar format accommodates a few musical numbers that identify Aakrosh as distinctly Indian, though they do make the movie a tad long. What adds to Aakrosh‘s appeal is that it deals with a topic unfamiliar to many Americans: honor killings. When honor killings make the news in the United States, they typically involve a young woman murdered by her own family for an act perceived as shameful. Aakrosh presents another side of the practice, in which suitors are killed in order to force a young woman into a political marriage approved by her family. The story’s heroes are Siddhant (Akshaye Khanna) and Pratap (Ajay Devgan), two investigators sent to learn the whereabouts of three Delhi medical students who disappeared from a village two months earlier. Siddhant, also from Delhi, is the lead investigator who assumes this case will proceed as smoothly as his previous cases have. Pratap knows from having grown up in the area that Siddhant’s rule-of-law methods won’t work in Jhanjhar. Pratap is all too familiar with the caste-based politics that separated him from his former flame, Geeta (Bipasha Basu), many years earlier. Geeta is now married to the corrupt and uncooperative police chief, played with sleazy aplomb by Paresh Rawal. Unhappy Geeta knows better than to let her violent husband see her talking to the feds. Siddhant and Pratap finally get a break in the case through sheer luck, since no one will help them. Their lives become more imperiled as they get closer to the truth about the missing young men. Siddhant is slow to admit that his by-the-book approach won’t work, and that Pratap’s method of hardball may be the only way to get justice. The atmosphere in Aakrosh is intense. Siddhant and Pratap are surrounded by enemies, always under surveillance. Even those who aren’t their enemies won’t risk their lives for two outsiders, giving the movie a feeling that’s simultaneously lonely and claustrophobic. Action scenes are refreshingly low-tech, relying more on parkour-style chases and fistfights than CGI special effects. The absence of cell phones and high-tech weaponry is appropriate for the remote setting. We’ve grown so accustomed to seeing slick gunmen in movies that a machete-wielding mob somehow seems much scarier. Aakrosh, while both modern and foreign, will feel familiar to fans of old Hollywood thrillers. Siddhant’s feeling of futility in the face of a corrupt social order will appeal to fans of the TV series The Wire. It’s also a good chance to catch lovely Bipasha Basu before she makes her Hollywood debut in Roland Joffé’s Singularity next year. 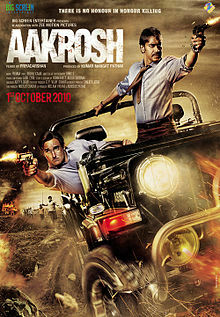 This entry was posted in Reviews and tagged 2010, 3.5 Stars, Aakrosh, Ajay Devgan, Akshaye Khanna, Bipasha Basu, Bollywood, Chak De India, Hindi, Honor Killing, Indian, Love Aaj Kal, Movie Review, Paresh Rawal, Singularity, The Wire, Thriller on November 3, 2010 by Kathy. I am really surprised that you have not mentioned that this movie is pretty much a rip off “Mississippi Burning”. There is nothing original in this movie apart from the fact that they replaced disappearance of civil rights activist with honor killing and added unwanted angle of romance in the movie. Thanks for pointing that out, Bharath. I haven’t seen “Mississippi Burning,” but now I’ll definitely have to check it out. I am sure that you will like “Mississippi Burning”, I just wish that Bollywood directors wouldnt rip off good Hollywood movies and end up destroying a good story. Being an Indian myself I feel ashamed of such plagiarism. I was wondering if you ever got a chance to watch “Mississippi Burning” and notice the similarity. I haven’t yet, Bharath. With the Cricket World Cup underway, there’s a good chance we won’t get any new Hindi movies in U.S. theaters until March. That should give me a chance to check out “Mississippi Burning.” When I do, I’ll add a note about it to the end of this review.